Dazzle and Sizzle: ZARA HAUL- sale shopping!!! I am so excited to share with you some of the sale shopping I did from Zara yesterday. These outfits are actually a lot more amazing than what they look in the pictures. I just can't wait to wear them! The two skirts in red and green are high waisted.There textures and fit gives them a very sophisticated , classy and elegant feel making them tilt more towards formal wear but depending on the top you team it up with , they can look casual as well . A crisp white ruffled shirt with these two skirts would be perfect for office wear. I really cannot decide which of these is my favorites. Infact , I love them all! :).How about you? 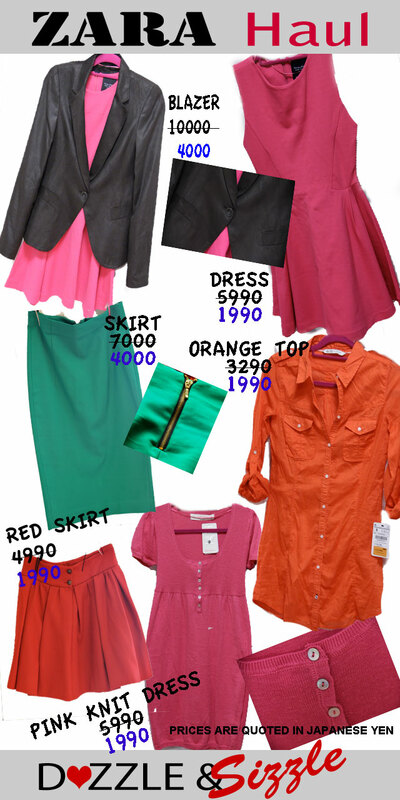 oohhh... nice haul.. tough to decide but my picks would be the blazer, pink dress on the top and the orange top...! OMG! i love EVERYTHING in this haul. How did u manage to get such amazing peices during the sale? And clearly, very heavily discounted. This post makes me want to shop again!